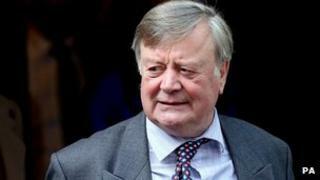 He never quite made it to prime minister, but Ken Clarke has joined an even more select group. Having been chancellor, home secretary, health secretary, education secretary, justice secretary and paymaster general, the Hush Puppy-wearing MP is now one of the top five longest-serving ministers of the modern era. He has been in office for a total of 23 years since 1972, according to a list compiled by the House of Commons library. Currently the minister without portfolio, Mr Clarke told the BBC News website: "At least the quantity of my public service is beyond doubt. I just hope the quality has matched it sometimes." But if the Conservative MP for Rushcliffe in Nottinghamshire is eyeing up the record, he will have to put in another six years. The person who has given the most service to the UK government as a minister during the modern period is, unsurprisingly, Winston Churchill, a fellow cigar aficionado. Usually a Conservative, but for for some years a Liberal, he put in 29 years, starting as a minister for the colonies in 1905 and ending his career at 10 Downing Street 50 years later. The table only includes those at least part of whose careers happened in the 20th Century, so the likes of William Gladstone, Pitt the Younger, Lord Liverpool and Robert Walpole do not feature. Another Conservative Prime Minister, Arthur Balfour, is second to Churchill, having served for 28 years. The last man to beat Mr Clarke's total was third-placed Richard "Rab" Butler, at different times deputy prime minister, chancellor, foreign secretary and home secretary. Often touted as a future PM but never quite making it, he ended having clocked up a full quarter of a century in office between 1932 and 1964. And in fourth place is the Liberal Spencer Cavendish, Duke of Devonshire, who ended his ministerial service in 1903. If only Labour had not spent an unusually long 13 years in power under Tony Blair and Gordon Brown, Mr Clarke could have surpassed them all by now. His friend Lord Deben, formerly John Gummer, who served in government himself for 16 years and has known Mr Clarke since the pair were undergraduates at Cambridge University, admires his stamina. He said: "The fundamental thing about Ken is his relaxed attitude. He feels strongly about things and cares about a whole series of issues, but he carries it all very lightly. "Some people think that means he doesn't care, but he does. He has a lot of drive." Lord Deben added: "He's a together person. What you see is what you get. He tells people to their faces what he says when they're not there. That's why he's so popular. He's never plotted against anyone, so John Major and Margaret Thatcher trusted him." Mr Clarke served under Edward Heath, throughout the Thatcher and Major premierships and rejoined the government as soon as David Cameron's coalition seized power in 2010. Despite his popularity in polls, his pro-European views were widely blamed for him failing to succeed in the Conservative leadership contests of 1997, 2001 and 2005. Nicky Morgan, Tory MP for Loughborough, which borders Rushcliffe, was born in 1972, the year Mr Clarke first entered office. "I'm full of admiration for Ken," she said. "The job of MP and of minister has evolved so much over the years, with the speed of modern communications, and he's held up amazingly. "Talking to someone of his experience allows you to appreciate the broad sweep of history. Ken clearly still loves being on the front bench and being a constituency MP. "No two days are ever the same, but he is a great example of pacing yourself and taking the rough with the smooth. For a new MP, his career is inspirational." The biggest chunk of Mr Clarke's time in office came during Mrs Thatcher's long ascendancy. Lord Deben said: "I suppose we were lucky that there was such a long period of Conservative rule, which gave me and Ken the chance of a long ministerial career. But, when Labour was in power, the Conservative Party should have chosen him as leader. He would have been better than Iain Duncan Smith. He was our lost leader." In 1964, a few months before Rab Butler left office for the final time, another Tory, the England fast bowler Fred Trueman, was asked if he thought anyone would ever surpass his recently reached milestone of 300 wickets in Test cricket. The Yorkshireman replied: "If anyone beats it, they'll be bloody tired." Gazing around the cabinet table at his younger colleagues, Mr Clarke - a cricket fan who shows no sign of wanting to leave office at 72 years of age - might well agree.